Feeling unhappy with your marketing material? Wish you could make it snap? Can’t decide what to focus on or where to start? You need a copywriter who can fix that. One you can rely on for a writing style and an approach exactly right for the occasion. If you’re wrestling with a marketing campaign, you need a copywriter to dig out your inner chameleon to find a fresh angle. An angle that makes you shine. Whether you’re producing a website, emails, press releases, social media, blog posts ... or any material that needs to represent you, your product or your service with clarity and confidence. Are you after copy that’s the equivalent of a party dress? Or maybe your best bib and tucker? Or how about some buttoned-down workwear? Then get a copywriter who can think and feel. One who puts the focus on your message and the customers who need to hear it. Who can distil the essence of your brand, transforming it from straightforward to engaging and inspirational – every time. That’s why it’s time for some chameleon copy to represent your business – in all its true colours. Using words that give you a memorable voice and verbal identity, without hyperbole or slippery sales jargon. All delivered on time and to budget. Click anywhere on the portfolio below to see a few samples from my copywriting wardrobe. Some pieces are short, smart, snappy. Others have more narrative sewn in, for extra SEO oomph. All are designed to achieve results over and above the objectives of the brief. And the aim of every piece? To build confidence in your message, trust for your brand and empathy from your readers. You may be wondering how much my copywriting costs. I work for myself so you won’t get slapped with agency rates. A professional copywriter probably costs less than you think. Simply ask me for a quote. It’ll save you the embarrassment of having to don a reptile suit or speak in outdated sales banter. I promise. The hero section fizzes with confidence and presents prospective clients with a challenge. The breezy copy stays firmly on the right side of professional while using the voice of a dynamic young design agency. Be honest. Do you avoid chuggers? l’ll admit I sometimes used to. Perhaps it’s time we stopped averting our gaze? We stand to gain far more than we give. In rewriting the pitch card used by canvassers for the Raw Hope campaign on behalf of children’s charity World Vision, the aim was to inspire regular monthly donations from passers-by on the street. So it’s a quick read and gets straight to the point. Simple language, conversational sentence fragments and short paragraphs build the argument for why people should help. The copy is forthright and optimistic, based on the premise that being asked to give should make people feel good. The words are hard-hitting and emotional but never mawkish. Be warned: the piece includes details about the shocking events of two young girls’ lives. Writing assignment for a sample home page. Written while brushing up my skills with the Blackford Centre Copywriting Diploma. The CONQUEST home page reassures professional and domestic gardeners they’re in the right place for top-end lawn mowers and garden tools. Touches of irreverence prevent it all getting too serious. Who said gardening had to be boring? I had a ball adding punch to the pizzazz for the company bio of a high-end film and print production company. Search-engine optimized website copy for the home page and six category pages. Targeting design-focused customers, the site starts a conversation with visitors about Neil Martin’s unique contemporary approach to design, highlighting his ethical stance as well as the features and benefits of his handmade wooden boxes – all made from sustainably-sourced timber. Testimonials, images and captions reinforce the copy throughout. Within a few weeks, the home page was ranking high on page 2 of Google for an extremely competitive keyword. It’s now on page 1 of Google for the same keyword, hovering between No.3 and No.5 of the organic results, perfectly poised between internet giants Etsy and eBay. Now that’s a result! These sections of copy below the fold on the home page invite visitors to dive deeper into the site. How? 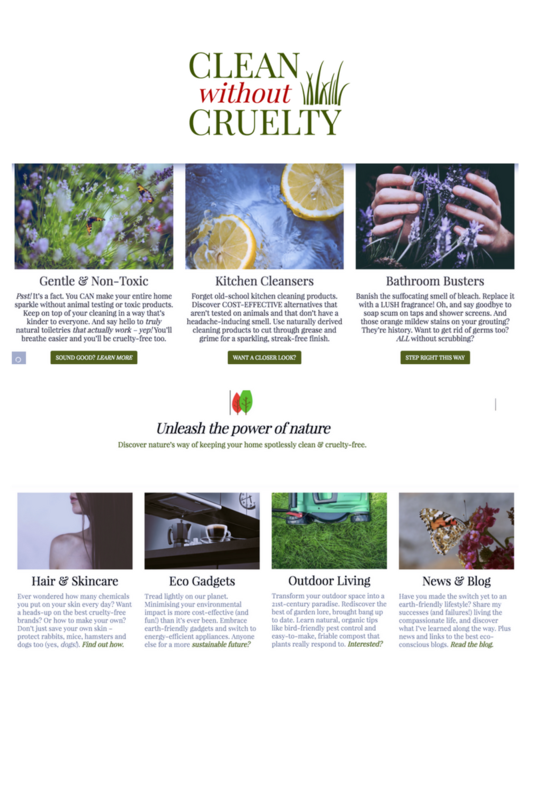 The images and captions engage interest and drive home the benefits of cruelty-free products, while the hyperlinked and button copy is friendly and focused on getting visitors to click through to the next page.